I know that it isn't quite the end of April, but I thought that I would share with you how our no-spend month went. I told you about our no-spend month here. Basically, we decided not to purchase anything unless it was fruit, vegetables, dairy, eggs or pharmacy items. I keep track of our budget and lately we have been trying to cut our spending as Hubby's work has been slow. We easily cut our spending by 75%! I was shocked. I didn't realize how many unnecessary purchases I was making every week. I thought that I might have to get creative with our meals near the end of the month, but I really won't need to. We had that much food in our pantry and in our deep freeze. We are so fortunate to have such an abundance of food within our reach, but this month has taught me that I need to be more mindful with our purchases. I don't want to be wasting food. On a financial level, throwing away food is just throwing away money. On an ethical level, throwing away food is a disgusting misuse of something that fills one of our most basic human needs. I could do better by using the money I would save being mindful to help others. We had guests twice this month. Hubby's family came for the weekend at the beginning of the month and my family came to celebrate Hubby's birthday with us. I had more than enough food (except that darn icing sugar) to keep meals and snacks going for everyone. I always feel like I need to go out and purchase a bunch of stuff when we are entertaining, but I really don't need to do that. We ran out of bread halfway through the month so I baked some. 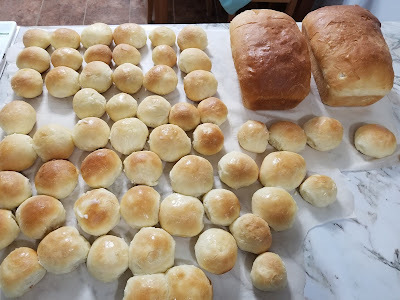 The buns and bread that I made turned out pretty good and we were good to go! It was much cheaper to bake our own bread so I will probably give try that again. Not perfect looking, but still delicious! We didn't eat at restaurants this month, which also saved us a ton of cash. We don't eat out a lot (once every 2 weeks), but it is super expensive when we do! Even the places that used to be "cheap" cost an arm and a leg. Now that we are aware of how much money we can save by eating at home, we will be much more likely to avoid spending our money that way. We plan to have the odd treat here and there, but it really is a waste of our money. This month has taught us quite a bit about how we use our money. I really don't need to stockpile groceries. I truly didn't realize how much stockpiling I was actually doing. We have enjoyed being creative with our time and finding ways to have fun without spending money. Have you ever done a no-spend month? I would love to hear all about it!